Acute skin inflammation marked by raised wheals, weeping or greasy exudate, redness and itching. Applied for weeping eczema, urticaria (allergic hives), boils, rash, poison ivy and carbuncles or open lesions with pus are some of the imbalances satisfied clients have used this product for. 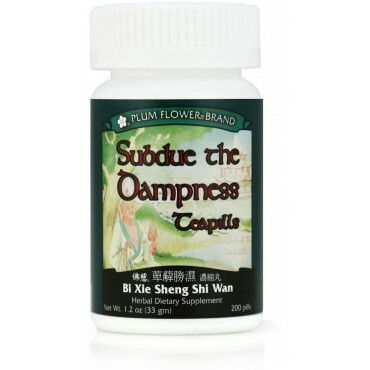 Clears Damp-Heat from the Lower Jiao, Resolves Toxins, Dispels Pathogenic Wind, Cools the Blood, Disperses Swelling, Separates Turbid from Pure, Promotes Urination. Coix lacryma jobi seed, Poria cocos fungus, Dioscorea hypoglauca rhizome, Dictamnus dasycarpus root-bark, Tetrapanax papyriferus pith, Phellodendron chinense bark, Alisma orientalis rhizome, Paeonia suffruticosa root-bark, Gardenia jasminoides fruit, Activated carbon, Botanical wax, Talcum. - Yi yi ren, Fu ling, Bi xie, Bai xian pi, Tong cao, Huang bai, Ze xie, Mu dan pi, Zhi zi, Activated carbon, Botanical wax, Talcum. Contraindicated during pregnancy. Use with caution in Spleen deficient individuals with a tendency to loose stools, diarrhea, poor appetite or chronic digestive weakness. I was working in a place that required me to wear food service gloves and I had a bad reaction to the material they are made from. Nothing would get rid of the horrible itching rash completely till I used Quell the Surface and Subdue the Dampness teapills simultaneously for 3 weeks. Thanks for a great product!